​ Meet Alissa Burson. 22 year old pro barrel racer, who also works at the Josey ranch in Marshall, TX. Alissa started riding in the 5th grade, and unlike several of the women I met that week, horses weren’t a family thing. She jokes about how she first told her parents she wanted to barrel race after seeing the NFR on TV and they kind of just pushed it to the side. A little down the line she began riding with a family friend, who later gave her a horse to train. The catch? He was a 2 year old. While working with the 2 year old, Alissa got an old retired paint horse and found some local barrel racers to take lessons from. One lady in particular, Nancy Brimhal, took Alissa under her wing and taught her some of the most valuable lessons in horsemanship that she says she still uses today. 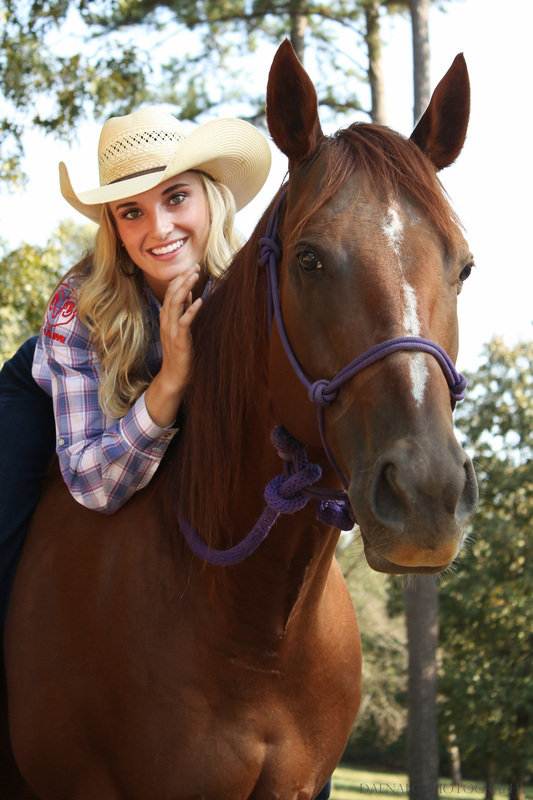 ​ ​Once in high school, Alissa knew barrel racing was something she wanted to pursue. She cracked a few jokes about how she worked in the family business of selling cars, and while she was good at it, she knew she didn’t love it. All roads lead back to rodeo. 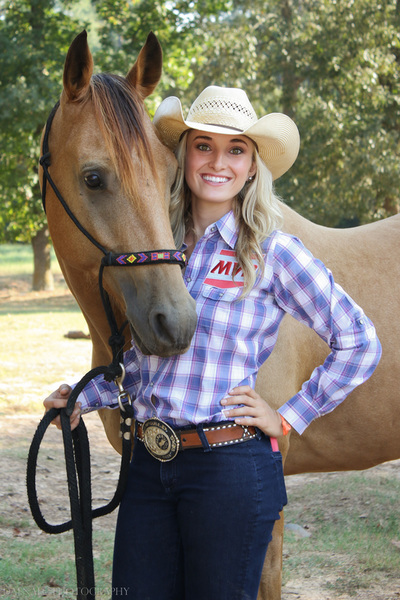 After deciding she needed another horse, she found and bought an 11 year old gelding from Fallon Taylor. Alissa talked about how she was incredibly successful all throughout high school in not only barrels but poles, breakaway roping, and goat tying as well. She credits that horse to being the one who really taught her how to rodeo, and put her on track to following her dreams. 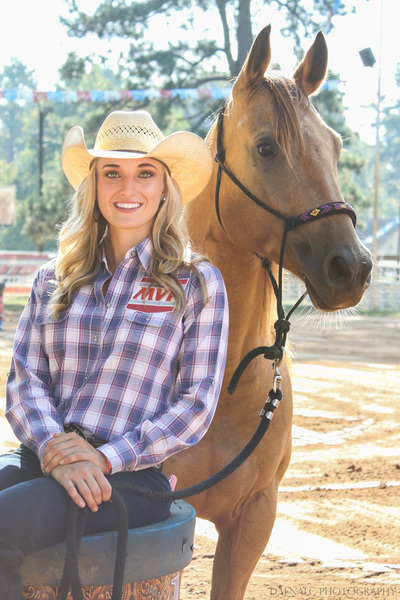 ​ When asked what her biggest accomplishment has been, Alissa immediately answered “I’ve been so blessed.” She talks about placing 2nd in the short go round in high school rodeo, and how she felt that was an important step that lead her to even bigger things. She went to college and won her first short go at her first ever college rodeo as was astonished. She said “I never dreamed that I’d be able to compete at a college level, so I was just over the moon.” After college, Alissa says one of the best things to happen was that she got her permit, and was able to start going to pro rodeos. On the second year of having her permit, she went to Tulsa for the first rodeo of the season and won. “I just could not believe it. My dreams were coming true.” She exclaimed, smiling ear to ear. ​ Alissa named Samantha Martinez and Marlene McRae as being 2 mentors and inspirations to her throughout her career. She says at local rodeos she found Samantha, who had been winning quite a lot, and asked for help. Alissa says she would go over to her house almost every day and train with her. 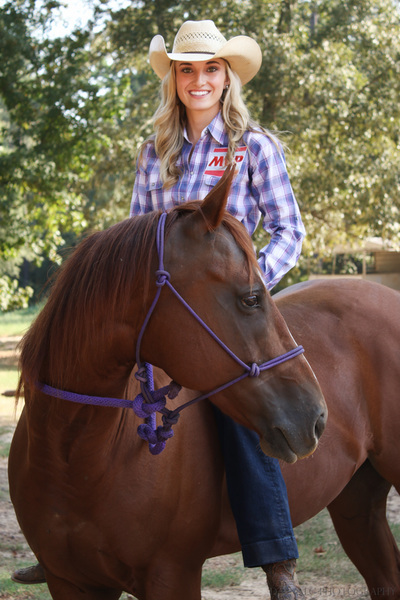 Later when she was searching for another barrel horse, Alissa found Marlene McRae, 10 time NFR qualifier and world champion, and started taking lessons from her. After a year, she went to work for Marlene and lived with her. “She was there every step of the way. She put a good foundation down for me to understand how to be a professional barrel racer to the next level.” Alissa said. Further down the line and a few more wins under her belt, she bought a horse from the Josey ranch. After meeting Martha Josey, her husband R.E. Josey, and the rest of the staff at the ranch, Alissa eventually started working there. She talks about how they’ve become a family to her and she’s learned more than she could’ve hoped for from them. She credits all of these past and present mentors to be the reason she is so successful. ​ I asked Alissa what it was like to compete against friends and does it influence her in any way? She explained that while she runs against friends all the time, she doesn’t feel it changes how she competes. Despite wanting to win, she’s standing at the fence screaming her head off when a friend is running. She talks about her and her hauling partner and explains “She’s in my rig, and I want my rig to do the best at the rodeo that night. Regardless if it’s me or her.” Alissa also says that running against friends is helpful in a way, because you have people that can give you honest advice on your run when you come out of the arena. ​ Alissa could not have had a more perfect response when asked if she could change 1 thing about the barrel racing industry. “I just wish it was easier to access. It isn’t like a normal high school sport where you can pick up a soccer ball and kick it around. Horses are an investment.” She explains how that is something the Josey ranch is trying to help. They loan horses to beginning riders, and offer help to anybody at their clinics. ​ When asked about the accuracy of the TV shows displaying the rivalry and drama in this industry, Alissa had a brutally honest answer. “There is drama everywhere you look, if you want to find it.” She talks about how there is drama in any sport in the nation, and that it’s given unnecessary attention. However, she points out that the people that are the top in the nation are there because they are focused on doing their job and following their passion. They aren’t talking bad about one another, instead they’re helping each other and it shows in the end. ​ I asked Alissa how would she describe the rodeo community and she answered it with one word; Family. Since leaving home after high school to pursue her dreams, she hasn’t had much time to be with her family, but she says the rodeo community has made up for that. Alissa talks about how she now considers to have family all over the place because of rodeo. She has friends that are there for her just like family, and people that will offer her a place to stay whenever she is traveling. She says the people in rodeo are some of the friendliest and most giving people she has ever met. ​ The best advice Alissa can give to anyone is something she did herself. “Seek out people around you that are successful. Start off riding with a peer, and you can learn a lot. Then go find a clinic from a professional if you feel you need more.” She said. The best advice comes from experience and that could not be more true. Alissa rode with friends and learned from there, and then she continued to find more help. You can never stop learning. ​ My final question to Alissa was how does she balance rodeo with other aspects of her life, and she made a pretty unique observation. “I feel like people who rodeo can really balance the most.” She commented. There’s always a huge list of things to do, and it somehow gets accomplished. Alissa jokes that you might lose a little sleep, but that’s what coffee is for. She talks about how she plans her rodeo schedule around the clinics at the Josey ranch because that is something that is incredibly rewarding to her. Regardless of how hectic things may get, they always work out and they’re always worth it. ​ ​Overall, I have to say Alissa is one of the most kind-hearted people I have met in my life. After emailing her, and talking on the phone a few times about my ideas for this article, Alissa helped me set it in motion. She connected me with Caitlin Lamb and set up an interview with Martha Josey and I owe a lot of my motivation for this project to her. Since meeting her at the Josey ranch for the first time, she gave me a lot of advice to implement on my own horses, and has texted me almost every other day since then checking up on me, my horses, and the progress of the article. Seeing her speak about her journey and the passion for what she does, has not only inspired me, but I really hope it will inspire others too. Alissa, from the bottom of my heart, thank you and I can’t wait to see you on TV at the NFR one day! Click below to see a few shots from Alissa's photoshoot.